Born in Chile in 1915. The daughter of two Spanish immigrants who arrived in Chile after a long journey in a ship that crossed Cape Horn. She married very young and had four children. 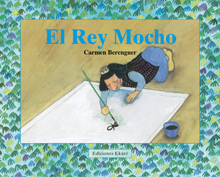 Of the many stories that she told her children and grandchildren, El Rey Mocho was one of the favorites. She died in Caracas, Venezuela in 1981 where she went to live with her children after the military coup of 1973.